Implements & Attachments Find everything related to operating, servicing and maintaining that loader, mower, blade, snow blower, tiller, hitch or scraper, right here. Long time lurker and first time poster ... I see a lot of knowledge and help here on the forums ... 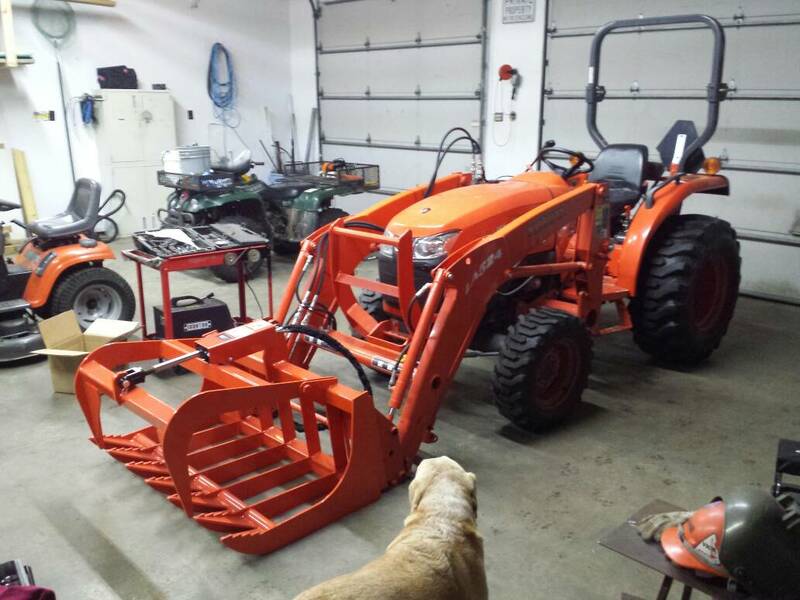 I'm not new to tractors but this is my first Kubota and excited to get it home and play ... I have read and watched video's on the third function until I'm really confused ... looks like either WR Long or Land Pride ... is one more user friendly than the other, better kit as far as hook up's? Also wanting a root/rake grapple to pull shrubs and cedars .. I like the looks of the Wicked 55" but rated at 40 hp .. tested at 60 hp ... but a nice 200 lbs ... but he also has a 60" construction grapple rated at 60 hp at a better price but weights in at 479 lbs .... I would appreciate any help you can offer on these items and Thanks ahead .... The tractor will come with 7' LP blade and pallet forks if that helps any. I have a L3830GST, I got the ETA 60” wicked root grapple, love it, very strong and one of the lightest out there. I applied the WR Long 3rd function kit, it was easy to put on. I would also advise you to get the hose saver that ETA sells, it keeps your hoses under control wether you are using the grapple or not. I think they would be, I have not tried it since had a set of rear remotes added. That I had my dealer do. If you don’t already have them look at a set of Pats Quick Change lifting arm ends. They make hooking up very easy. I know what you mean, I’m 72 and do a lot of work around my place. I try to use a Diesel engine and hydraulics to do as much as possible. Also look at the Piranha Tooth Bar it really add to the utility of your bucket. There is a thread here in the Implements and Attachments section. It seams everyone who has one loves it. One last thing about rerouting the hydraulic hoses to the rear. Call the folks at ETA they are very easy to work with. They can make the hoses any length you want. Looks like an awesome and wicked machine.